The Depot Boijmans Van Beuningen will be a unique space for exploration, interaction and discovery. The Depot will be the first museum storage facility in the world to offer public access to the largest part of the 151.000 artworks from the Museum Boijmans Van Beuningen collection without the mediation of a curator. With the choice to enter with or without a guide, visitors will be able to watch what are usually the ‘behind the scenes’ activities of a museum, witnessing at first hand the extreme care devoted to each artwork and the attention to detail that is dedicated to responsibilities such as conservation, restoration, transportation and research. Offering unparalleled transparency into the active role that a museum carries within society, into what it is that a museum does and how a museum cares for its extraordinary holdings, the new Depot is expected to attract approximately 90,000 visitors per year. Located in Rotterdam’s Museumpark, next to the existing Museum Boijmans Van Beuningen building, this 39.5-metre high building with a total floor area of 15,541 metres squared is designed by Rotterdam-based architectural firm MVRDV, led by Winy Maas. The building will have a variety of climate-controlled situations tailored to art storage and visitor comfort. At its base, the building has a 40-metre-diameter footprint widening to 60 metres at the roof. The roof garden will be planted with seventy-five trees suited to high altitude and able to withstand the wind and weather conditions at a height of 35+ metres. The ambition is to create a building which is as sustainable as a BREEAM-NL classification of ‘excellent’. In addition to its role as the engine-room of the museum, the Depot will have a commercial role. Part of the building (1900 metres squared) can be rented as storage by private collectors, corporate collections or other museums. Those renting within the depot will be offered the same services and level of professionalism as the museum gives its own collection. Furthermore there will be a restaurant at the roof garden, ticketed events and guided tours, and a Depot shop. 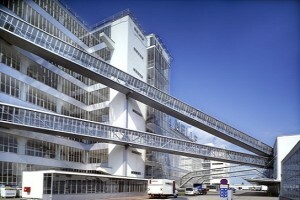 This entry was posted in NEWS and tagged Depot Boijmans Van Beuningen, Rotterdam. Bookmark the permalink.